About the Tour ! !See below for charters!! 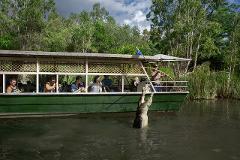 This Tour highlights the best of the Far North - Rainforest, Waterfalls and native wildlife! We'll immerse you in totally amazing landscapes both during the day then at night. As if this is not enough, this package includes entry into TWO Park attractions - Paronella Park and Mamu Tropical Skywalk. Dinner is enjoyed at the charming Mena Creek Hotel where visitors who choose this option can dine on a choice of 5 delectable meals as the sun sets over the tropical ranges. The World Heritage Listed rainforest of Tropical North Queensland is over 180 million years old. This ranks as the oldest or the planet. 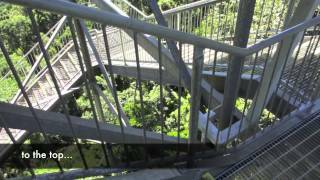 We'll show it to you from the bottom of the lush canopy right up to the top from 37m high viewing tower of Mamu Tropical Skywalk. Josephine Falls and Mena Creek Falls are rated as two of the most picturesque in the region. The short stroll to Josephine Falls is well worth the effort as the several levels of waterfalls make for excellent photography. You'll have a chance to cool off in the pristine waters at he bottom of the Falls. Mena Creek Falls is shown presented in the afternoon when hundreds of fish can be hand-fed then after dark, lit up by spotlights. Most Australian rainforest animals are nocturnal. On our return drive from Cairns, your driver will check sites where rarious animals including Wallabies and Kangaroos congregate, guaranteeing the spotlighting of Aussie wildlife! As we depart at 1PM, you can have plenty of time to enjoy the morning, Alternatively, choose from one of the numerous morning activities Cairns has to offer. Contact us or your tour provider for ½ day Green Island trips, Helicopter Tours, Hot-Air Ballooning, Horse Riding, Skydiving, Bunjy Jumping or a shopping spree. Explanation of World Heritage Listed Tropical Rainforest, day & night. Not too late to rise for early morning flights and reef trips the following day. This return time also allows plenty of time to enjoy Cairns’ night-life, including the must-see Nightmarkets which are open until 11PM!!! Everything to make your day/night enjoyable + better value & less hassle than self-drive! 100% guarantee of spotting wild Wallabies and/or Kangaroos! So come with us, save, and enjoy the perfect day out! Inquire about our Cairns Coach Charter Service, fully experienced and accredited driver guides are here for you and your group. Create your own custom tour itinerary or use our large fleet of vehicles for airport hotel transfers and general people moment in and around Cairns, Port Douglas and The Atherton Tablelands. We also specialize in Wedding charters, buck’s parties and hen’s nights, sports club Coach Charters, school trips and Company Convention Charters. Wow, the weather was perfect! With hardly a cloud in the sky, we took some fantastic photos today. Our guests are visiting from Melbourne. Please enjoy the rest of your stay in Cairns! Paronella Park is beautiful during daytime, but it is even more magical and romantic at night especially when the castles and waterfalls are illuminated. But why not join the Paronella Park Day & Night tour to enjoy both views when you can do it in one single tour? 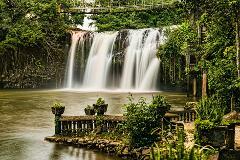 How amazing the waterfall at Paronella Park is?! Do you agree? Join the Cairns Day & Night Tour operates by Global Travel Services to experience the breathtaking view of Paronella Park both day and night time! One of the best swimming hole that you cannot be missed in Cairns. You will have a lot of fun by the natural "slide rock". You can also enjoy a rainforest walk there. By joining our tour, you will have a chance to enjoy the delicious tropical fruit platter! Just so much to offer! Book it now! 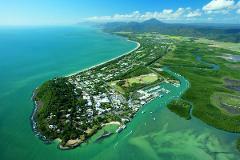 This is the view that one cannot be missed when travelling to Cairns. Sunset at Paronella Park is just amazing. Join the Paronella Park "Darkness Falls" tour to see the illuminated castle and waterfalls and experience the story of a dream comes true. Now go and book our "Cairns Day & Night Tours" to experience the ruined Spanish castles and its impossible dream. Not only are Cairns’ rainforests flourishing, but so are the events bringing more people to this spectacular place. June the 12th will bring 3600 athletes (780 of which are foreigners) to Cairns, described as ‘one of the world’s most iconic tropical locations and boasts a stunning backdrop that will take your breath away’ (IRONMAN). Competitors will begin the event by biking up the Captain Cook highway, hugging the coastline from Cairns to Port Douglas. It must be considerably hard for competitors to keep their eyes on the road ahead of them, as they are surround by two of Australia’s most iconic attractions: The Great Barrier Reef and the World Heritage listed rainforest. The race comes to a conclusion in the heart of Cairns city as competitors race along the Cairns boardwalk to the finish line. The race consists of a 3.8km swim, a 180km bike leg and a 42.2km run. For those who would rather relax in the comfort of a coach whilst taking in the same breathtaking coastal scenery to Palm Cove and Port Douglas, there are many coach tours which make this journey daily. On February 18th, 1978 the first ever IRONMAN which consisted of 15 competitors began in Waikiki, Hawaii. 1985, 13 years after the first ever IRONMAN, IRONMAN Australia was born. In 2011 Cairns saw the beginning of what looked like a similar event to Ironman. Five years on and Ironman Cairns is growing exponentially in popularity! Don’t miss out on a chance to enjoy the excitement in the air as Cairns prepares for many memorable moments on the track. The 2016 Cairns Airport Adventure Festival features an event for anyone and everyone, including: IRONMAN 70.3 Cairns, Coral Coast Triathlon, RRR Mountain Bike Challenge, Great Barrier Reef Ocean Challenge, Quicksilver Reef Swim – Green Island, The Cairns Post Bright Night Run and McDonalds IRONKIDS Cairns. The Cairns racing season is nearly upon us so best to book those plane tickets fast! Darren is a very professional tour guide. With his detailed explanation, we were able to be more connected to the places. A memorable tour! Thank you Darren!!! Thank you for your travelling and explanation. Thank you very much really. An amazing day! Thank you to our guide. See you next time! Thanks for a great day Darren (our popular GTS tour guide). Really enjoyed our trip. 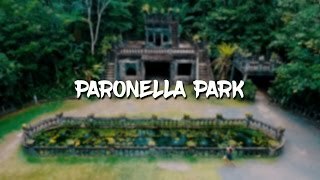 Absolutely loved Paronella Park. We would recommend this tour to anyone coming to Cairns! Well Done!!! Awesome tour, great service, great stories, informative, related, enjoyable day/evening. Overall, thank you!!! Thank you for driving and guiding! Although it was raining, I was really fun and I could meet many people from other countries. Thank you so much. I'm so glad I went! Paul is a great guide! I learned a lot on two trips and enjoyed every bit of it! Very Good Our tour guide, Stu, was fantastic, he shared lots of information on the bus to make the trip more enjoyable and showed enthusiasm and care with everyone. The waterfalls, canopy walk and Paronella Park were all very enjoyable (although the tour guide at Paronella park was nowhere near as good as Stu). Full on day, so quite tiring but well worth it. “Fantastic tour guide Victor” victor was so full of information and made the tour so interesting. Highly recommended. Our guide was very kind, nice guy. Steak was Fantastic! I'd like to recommend this day tour to my friends. :) Really fantastic! You will be picked up from your accommodation then taken for a dip at Josephine falls, then onto experience the rainforest scenery at Mamu Tropical Skywalk (on the outskirts of Innisfail), next is Paronella Park (shown on map) located in the quaint Mena Creek. Just across the road from Paronella Park is the Mena Creek Hotel where guests who purchased tour option 2 will have a choice of five yummy meals to enjoy in the old-style Queenslander pub. To wrap up a beautiful night, Wallabies can be sighted, as well as a star or two.